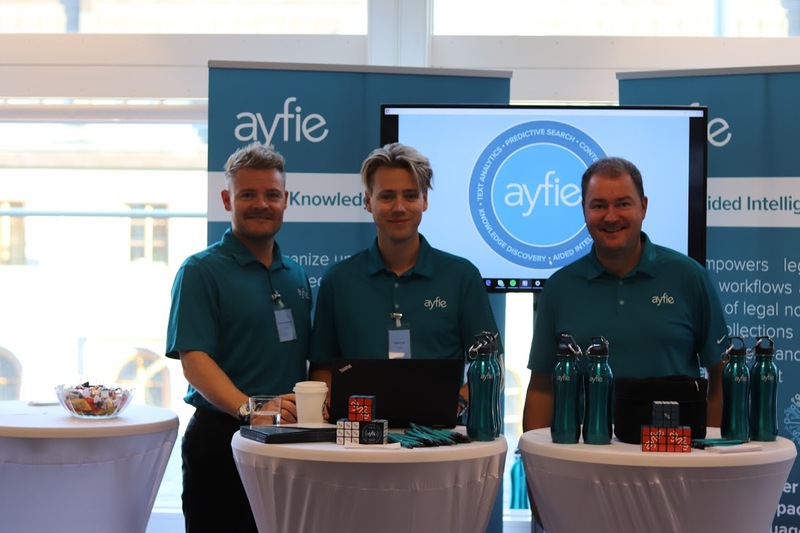 The ayfie team joined the Nordic Legal Tech Day in Stockholm last week. We had the pleasure of having a booth and running a live demo. The annual event focused on the digitalization and development of the legal industry, along with the future role of lawyers and legal departments. It was an interesting and energetic day of insights, learning and great discussions. Here are some of our key take-aways from the event. We see that the narrative shifts away from the hype around technology itself and instead focuses more on the value for clients. How can legal processes be improved to bridge the gap between the law and the users? During the first session on Legal Design, the panelists examined the idea of how design thinking can enhance legal operations. The discussion focused on how connecting legal, design and tech, with a customer-centric approach, will improve legal processes. By concentrating on user centricity and structuring workflows and data around user needs, it will be easier to understand and apply the appropriate legal processes and therefore bring better value to the clients. Data is considered to be the new oil and according to Gartner, more than 80% of companies’ data is unstructured. Most of the conversations we had throughout the event touched upon how companies struggle to retrieve and make use of data. Our booth team ran numerous demos where they showed how to easily find and utilize data in order to reveal information and valuable insights by using technology instead of manhours. As pointed out in another exhibitor’s presentation, up to 40% of lawyers’ time is wasted on low-value issues. In the discussion around manual versus automation, there is no doubt of the latter. By using technology to optimize data and reveal information, firms will more efficiently be able to obtain the correct and relevant answers, which in turn will help them win more clients. In the era of intelligence, it’s all about using the knowledge we have in the best way possible. The knowledge may be in the past, but the way to work and maximize that knowledge is in the future. Its’s all about next practice and not best practice. By using intelligent technology and AI, lawyers can be freed up from repetitive work and focus more on areas like strategy, vision and ethics. Taking away the legwork and the time spent on low-value tasks was a focus in several sessions. Legal wants to be perceived as an enabler and give law the position it deserves. Measuring efficiency and saving time become important KPIs, and tech is seen as an enabler to support and drive the business forward. According to the 2018 Nordic General Counsel Report, however, only 52% of the legal departments are using tech tools, and the GC’s are struggling to get their head around tech and how to use it. Those who understand the value and get there first, will have the competitive advantage. Digitalization is not just about having a digital strategy. It is about having a vision that evolves around how technology can accelerate the strategic direction, and make sure that purpose, digitalization and business goes hand in hand. For the legal sector, the future is all about enabling interdisciplinary ways of working and replacing legwork with brainwork. Want to learn more on how ayfie can help you tackling these topics? If so, please contact us or schedule a demo to see ayfie's products in action!